Business Relationship Management Institute (BRM Institute) is proud to serve the global Business Relationship Management community as the world’s first Business Relationship Management professional association. We strive to provide our members and customers with the top products and services available and recognize that building a long-term business relationship with you depends a great deal on trust. This trust begins with our continuous commitment to respecting and protecting the privacy rights of our members and customers and complying with all applicable privacy laws in countries in which we do business. Once you consent by providing us with your personally identifiable information (ex. name, address, e-mail address, phone number, etc. 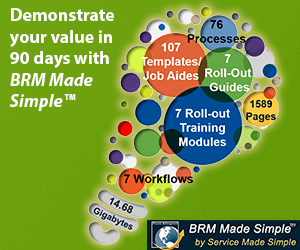 ), be assured it will only be used to support your member/customer relationship with BRM Institute. Our membership application and events registration processes ask you to submit personal information. The personal information you submit to BRM Institute will be protected by industry standard security and management procedures and will be used only for the purpose for which it was submitted unless you request or agree otherwise. On BRM Institute’s websites, over the telephone, or through the mail, you are able to order products or services from BRM Institute, apply for BRM Institute membership, register for events, and participate in volunteer initiatives. The types of personal information collected by BRM Institute may include your name, employer, job title, billing or payment information, and business or home telephone number and e-mail addresses. When applicable, we may also ask you for information regarding your personal or professional interests, demographics, experience with our services, products, and your contact preferences. In accordance with the General Data Protection Regulation (GDPR), BRM Institute will always request your permission prior to collecting and using your personally identifiable information for its intended purpose. a) BRM Institute uses the information you provide to better understand your needs and deliver valuable tools. Specifically, we use your information to help complete transactions requested by you, to communicate back to you, and to offer and update you on BRM Institute services and benefits. Credit card numbers are used only for payment processing and are not retained for other purposes. b) As a benefit to BRM Institute members and certification holders, BRM Institute may include your name and relevant information in BRM Institute directories. We may also contact you for market research purposes or to provide you with information we think would be of interest. BRM Institute will not reveal your personal information publicly or to any third party (except as stated below), unless we receive your explicit permission to do so. For example, the BRM Institute membership application includes a question asking if you want your name included in mailing lists, BRM Institute announcement lists and BRM Institute directories. Your name will not be used for any such purpose unless you affirmatively request BRM Institute to do so. In addition, if at any time you would like to have your name removed from BRM Institute lists and/or directories, please follow the directions given below in the Choice section (Section 2) of this document to opt-out of such contact. Without your express prior permission, BRM Institute will not use or share the personally identifiable information provided to us for purposes other than those for which the information was originally submitted. We will also provide you the opportunity to opt-out of partial or total contact from BRM Institute and we will comply with such requests. This choice regarding communications from BRM Institute is offered on our membership and certification applications, registration forms, web pages, through support inquiries, or at the bottom of all communications from us. If you have any difficulty exercising your choice to opt out, please contact us via email, or by phone at +1.888.848.3012. BRM Institute strives to keep your personally identifiable information accurate. We will provide you with access to your information, including making every effort to provide you with online or telephone access to your data so you may review, update or correct your personal information. To protect your privacy and security, we will also take reasonable steps to verify your identity before granting you access or enabling you to make corrections. If you are a BRM Institute Professional Member, you can access your personal information by logging into the BRM Institute Online Campus and selecting the option to edit your profile. You may also request a change in your personal information by contacting us via email, or by calling +1.888.848.3012. 4.1 BRM Institute is committed to ensuring the security of your personally identifiable information. To prevent unauthorized access or disclosure, maintain data accuracy, and ensure the appropriate use of information, we have put in place appropriate physical, electronic, and managerial procedures to safeguard and secure the information we collect online, in accordance with all applicable laws in the countries in which we do business. We use data encryption technology to help protect against the loss, misuse or alteration of your sensitive credit or debit card information. We use Secure Sockets Layer (SSL) technology, which creates an encrypted connection between you and our systems for the transmission of any credit or debit card information you input online, and we use encryption protection for any payment authorizations for transactions we request through any channel. If we collect your credit card or debit card information, it is transmitted over an encrypted secure channel directly to the credit card processing service and is not stored on our systems. 4.2 Any unauthorized access to, or use of, any of our websites and other products and services, or to the information collected and maintained by us should be immediately brought to our attention by contacting us via email, or by calling +1.888.848.3012. We will investigate, and, if necessary, take action to halt any violation of the security of your personal information of which we become aware. 4.3 Your access to some services and content is password protected. We recommend you do not divulge your password to anyone. BRM Institute will never ask you for your password in an unsolicited phone call or email. You should never disclose your username and password to others. In addition, if applicable, you should remember to sign out of your BRM Institute account at the end of each session. You may also wish to close your browser window when you have finished your work. This is to ensure others cannot access your personal information and correspondence if you share a computer with someone else or are using a computer in a public place, such as a library. 4.4 Unfortunately, no data transmission over the Internet can be guaranteed to be 100% secure. Accordingly, despite our best efforts to protect your personal information, BRM Institute cannot completely ensure or warrant the security of, any information you transmit to us, or to or from our online products or services. You transmit all such information at your own risk. However, once we receive your transmission, we make our best effort to ensure its security on our systems. BRM Institute will not retain data longer than is necessary to fulfill the purposes for which it was collected or as required by applicable laws or regulations. BRM Institute Professional Members with an active account will have the responsibility to update and delete any personally identifiable information within their account they no longer want to be associated with themselves. When a member’s account is disabled, all personal data collected through the platform will remain a part of the member’s disabled account unless the member contacts us via email, or by calling +1.888.848.3012 and asks that it be permanently removed. b) Most aggregate information is collected via cookies, web beacons and other technical methods. Web beacons (also known as clear gifs), in conjunction with cookies, are used to compile statistics about site usage. Web beacons are small pieces of data that are embedded in images on the pages of websites or applications. We, or our service providers, use these technical methods to analyze the traffic patterns on our websites, such as the frequency with which our users visit various parts of our websites and to measure site effectiveness or use of online products and services. c) Cookies may also be used when you share information using a social media sharing button on our websites. The social network will record you have done this and may use this information to send you targeted advertisements. The types of cookies used by these companies and how they use the information is governed by their privacy policies. d) When you enter your contact details in a web form on a brm.institute site, in order to subscribe to a service, download a white paper or request information about BRM Institute’s products and service, your contact details may be stored in a cookie on your device. This information is then accessed on subsequent visits to institute sites, allowing us to track and record the sites you have visited and the links you have clicked, in order to better personalize your online experience, and future BRM Institute communications. e) If you choose to receive marketing emails or newsletters from BRM Institute, we may track whether you’ve opened those messages and whether you’ve clicked on links contained within those messages through the use of web beacons and personalized URLs embedded in these communications. This allows BRM Institute to better personalize future communications and limit these communications to subjects that are of interest to you. f) While BRM Institute websites do not, at this time, recognize automated browser signals regarding tracking mechanisms, such as “do not track” instructions, you can generally express your privacy preferences regarding the use of most cookies and similar technologies through your web browser. You can set your browser in most instances to notify you before you receive a cookie, giving you the chance to decide whether to accept it or not. You can also generally set your browser to turn off cookies. g) Since cookies allow you to take advantage of some of our websites’ features, we recommend you leave them turned on. If you block, turn off or otherwise reject our cookies, some web pages may not display properly, or you will not be able to add items to your shopping cart, proceed to checkout, or use any website services requiring you to sign in. h) Some of our websites use Google Analytics cookies. Information collected by Google Analytics cookies will be transmitted to and stored by, Google on servers in the United States of America in accordance with its privacy practices. To see an overview of privacy at Google and how this applies to Google Analytics, visit https://www.google.com/policies/privacy. You may opt out of tracking by Google Analytics by visiting https://tools.google.com/dlpage/gaoptout. Links to third-party websites, for example, our registered providers and strategic alliances, are provided solely as a convenience to you. If you use these links, you will leave the BRM Institute website. BRM Institute has not comprehensively reviewed all of these third-party sites and does not control, and is not responsible for, any of these sites, their content or their privacy policies. Thus, BRM Institute does not endorse or make any representations about them, or any information, software or other products or materials found there, or any results that may be obtained from using them. If you decide to access any of the third-party sites linked to this site, you do this entirely at your own risk. If you have any questions or comments regarding our privacy practices, please contact us by email or call +1.888.848.3012. BRM Institute is subject to the jurisdiction of the Federal Trade Commission. Any disputes arising out of a breach of this policy will be submitted to and resolved by the privacy dispute resolution procedure set up by the Direct Marketing Association. 5/23/2018 – Updated with GDPR Compliance terminology and procedures.